Finding the correct pillow to satisfy your needs can be quite challenging. There are many factors to consider when making this decision. Each pillow has different features that can be an advantage or disadvantage for you. We are going to cover each one and our goal is to help you find the most suitable pillow for your case. 2.1 How to Choose the Correct Shape? 2.2 What Pillows Should You Use for Different Sleeping Positions? 2.3 Can You Adjust the Height in All Pillows? 2.4 Can You Wash and Dry Every Pillow? This pillow is appropriate for a queen size bed. It’s made from 60% polyester and 40% Rayon; it’s coated with premium microfiber and this could help you achieve the rest you need. This model is great for all sleeping positions as you can remove or add foam to your preference. And another thing, because of the feature mentioned above, you can shape your pillow which could relieve any pain on a specific area. The cover is removable which is very convenient if you want to wash it and it’s made from a breathable fabric that keeps you cool throughout the night. And since the cover is washable, you can avoid constant dust which is great for people with allergies. From previous experiences we know that some pillows are made from foam that isn’t very comfortable or safe, so you should know that this one is certified by the U.S.
A great feature is the fact that the company gives you 100 days after purchase and you can get a full refund within that time; we think this is great if you’re trying to find the most suitable pillow. 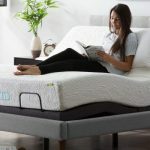 We are honestly amazed by the amount of positive reviews on this item, as in for the price we think it’s accessible considering this type of product helps you rest. Go check out the Coop Home Goods Pillow here on Amazon. This pillow consists of 6 inner layers that can be adjusted for your preferred position, we think this is a great feature because you can use it for different activities by adding or removing a layer. And in case you’re wondering the product comes with an extra case for you to store the remaining layers while not in use. 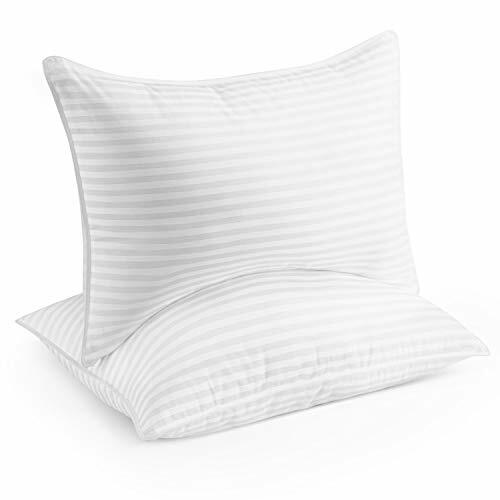 The pillows themself are 100% polyester and the cover is 100% cotton; and one more thing, it has a 300 thread count. It has microfiber foam and it’s also hypoallergenic which is great if you’re having trouble finding the correct pillow because of your allergies. We think this is a good choice if you’re buying pillows for your family and have no idea what their sleeping positions are. This is actually the most expensive item from the review and we do think it’s a bit high priced but you can adjust it as wanted and it could help you find the exact comfort you’re looking for. And one last thing, although this pillow is expensive you can always purchase another cover or use the storage one in order to obtain more than 1 pillow from the layers. Get a look at the Pancake Pillow here on Amazon. 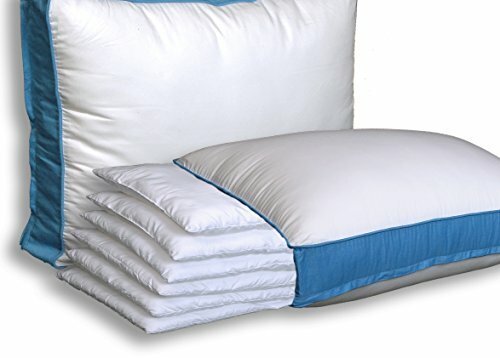 This model is the only pillow in the review that’s filled with gel fiber, this is a good feature because it keeps the pillow cool throughout the night. The pillow is 100% cotton and it has a 240 thread count. It’s a non shift design which is quite convenient for those of you that tend to move a lot during the night. This feature makes sure your head stays in place so you won’t have any issues in the morning. Another great feature is the fact that it’s dust and mold resistant, if you have had any previous experiences then you know this is very unpleasant. They are also chemical free which makes it a good choice for those of you with asthma. One thing we do want you to know is that this pillow doesn’t come with a cover. The pillow on the other hand is washable and you can put it in the dryer for a softer feel. We really appreciate when companies give you the option to return it if there’s any issue, in this case you get 30 days to do so. This model has a good price but considering you can’t adjust the height and it does not include a cover, we definitely think that if you have a bigger budget there are better options. Check out the Beckham Hotel Collection Pillow here on Amazon. This pillow is made from 100% Egyptian cotton and the thread count is 400. This is definitely a different pillow compared to the previous ones, it’s not exactly the common square shape pillow you are all used to. It’s a wedge shaped pillow which is very much recommended for people that must sleep in an elevated position. This pillow is helpful for those who suffer from GERD or acid reflux. Mayo Clinic recommends elevating your upper body to help reduce the onset of the two. It’s also great for breathing problems, back or neck pain and it could even help with snoring. The base is built from polyurethane foam and the top is a 1.5 inch memory foam, which has a channel that keeps the air circulating. Comes with a removable cover for ease of hygiene. The shape also makes it very comfortable for side sleepers and it keeps you from shifting during your sleep. One more thing for those that have allergy issues, the cover is removable and washable in order to keep the dust away. We think this is a good option to try out if regular square pillows aren’t relieving your back or neck pain, if it’s still not doing the job you have 30 days to return it. This model is the most budget friendly pillow from the review and it has good customer feedbacks regarding solving sleeping problems. 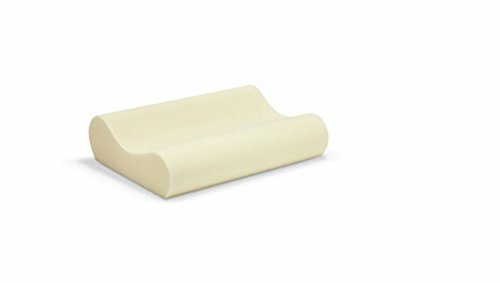 Have a look at the InteVision Wedge Pillow here on Amazon. We highly recommend this pillow for those of you that suffer from severe neck issues. The pillow supports your head, neck and shoulders which could prevent you from stressful mornings. The design of the pillow has a higher and a lower elevation on both ends from which you can switch around to help you achieve greater comfort. The higher end is 5.25 inches and the lower end is 4.25 inches. 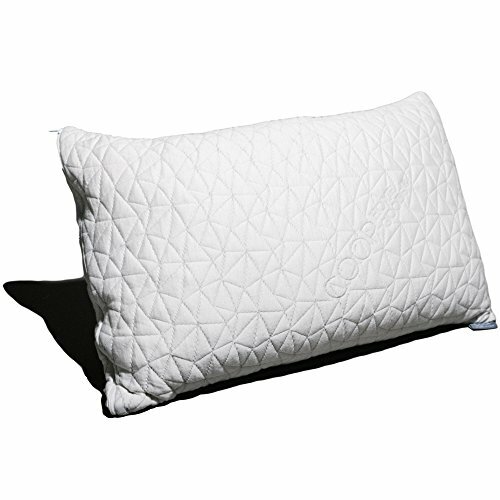 The pillow is designed to maintain its shape throughout many years and it comes with a 5 year warranty in case. If you have tried many pillows in the past and none seem to relief any pain, we suggest you make a change in the shape regarding the pillow. If you think that the previous wedge shaped model is a bit too big for you bed, we recommend this model because it tends to relieve neck pain and it’s a lot smaller. In the case of side sleepers, we suggest you use the thicker side in order for your shoulder to stay aligned and to avoid gaining any sort of pain in the morning. The feel of the pillow is very soft as it’s made from memory foam; but if your problem is the fact that pillows are not very firm then this may not be the best option for you. We consider this model has a good price and good customer reviews as well, the two level feature could potentially cure your neck problems. Go have a look at the Sleep Innovations Contour Pillow here on Amazon. How to Choose the Correct Shape? Picking a pillow can be hard with so many options but our recommendation is to pick one that’s adjustable because it can be reshaped for your needs. For those suffering from neck pain, contour pillows can help relieve strain on the neck muscles by providing much needed contact support. The filling is quite crucial as it determines the softness or firmness of the pillow. For the ones that can be adjusted this should not be an issue. Another factor to consider about the filling is the chemical addings, a few of these don’t have any chemicals but there have been reviews that say otherwise. If you have any allergy problems then you should read very carefully about this subject. We recommend most of the pillows in the review for a queen size bed. The size of the pillow should be linked to the size of the person as it can be too big or too small. The price is very personal and we can’t tell you how much to spend but we do suggest trying out different pillow types and shapes. The shape of the pillow is something to consider, our suggestion is to change the shape if you can’t seem to find real comfort with a regular pillow. Finally the popularity on Amazon is extremely important, we suggest you go through some reviews and answered questions. What Pillows Should You Use for Different Sleeping Positions? A very important point for side sleepers to consider is their neck and shoulder support, we recommend thicker pillows in this case to help prevent any pain issues due to the gaps. For back sleepers we recommend a slight elevate on your head to keep a good and stable position throughout the night. Lastly stomach sleepers should use a thin soft pillow in order to avoid putting pressure on the cervical vertebrae. Can You Adjust the Height in All Pillows? As you have read in the review there are some pillows that allow you to add or remove foam or layers. Another model has two sides with different elevations from which you can choose from. 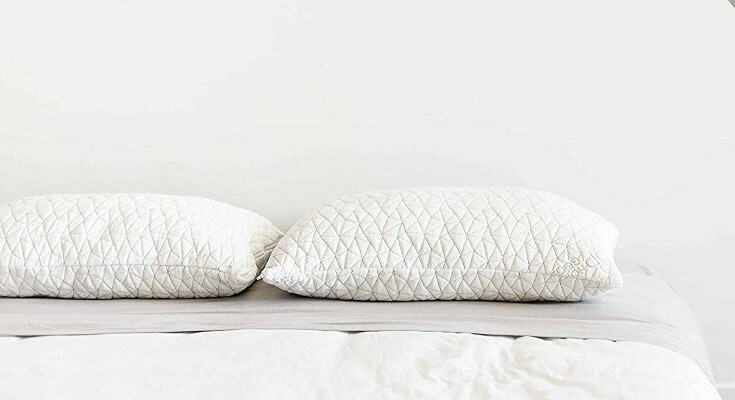 There are the typical pillows that have a general height that can’t be adjusted. There is also the angled pillow that can relief pain for many cases and it’s permanently elevated. Our top recommendation for you is that you pick one that is adjustable because it can be customised at any time regarding the situation. Can You Wash and Dry Every Pillow? Almost every pillow in this review comes with a cover which in all case is washable, this is vastly recommended by us because it keeps your space clean and it prevents allergies. It’s also very important for asthma and other conditions. We only recommend square pillows for the dryer as this can make them feel a lot more softer; other shaped pillows are either too big or not suitable. Most medical conditions require you to sleep in a certain position and we recommend an angled pillow as this elevates your body. Another advantage is the fact that it’s quite high so you won’t have too much trouble standing up if your condition is surgical related and you can’t apply too much pressure. Our final pick is the Coop Home Goods Pillow. This model comes in a square shape which can be adjusted by removing or adding foam. It has a fitting size for a queen bed and a good price as well. The positive customer feedbacks are outstanding and it’s great for all types of sleeping positions. The removable cover allows you to wash it whenever you feel it appropriate. You can also adjust the foam to have a different angle in order to relieve pressure on key points of your body.